Get creative with your snacks! All of these healthy snack ideas will leave you feeling satisfied without the taste of regret. I love having an arsenal of healthy snack ideas by my side and these will definitely not let you down. From low-carb options to paleo options to chocolate-y options to vegan options, I’ve got all of your taste buds and diet needs covered. This combination will not let you down! 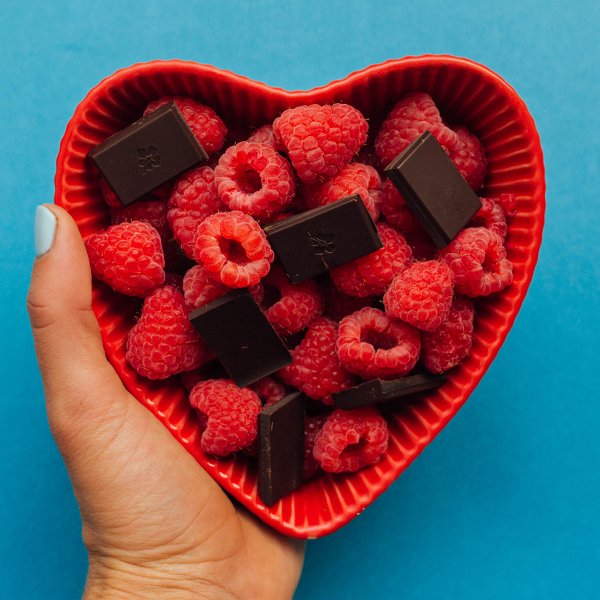 Just combine 1 cup of raspberries + 20g dark chocolate and your taste buds will jump for joy. High in fiber, protein, and superfoods, this all-in-one Shake is a great grab-n-go option! Blend Shakeology up with water and ice and you’re good-to-go. These cute berries do EXIST! What are kiwi berries? They are a perennial vine native to Japan, Korea, Northern China, and Russian Siberia. This vine produces a small fruit resembling the kiwifruit. At only 87 calories for 1/2 cup, this easy option makes for a great healthy snack idea at work or on-the-go. Can’t say no to the classic peanut butter banana combo! All you have to do is cut a medium banana into slices and add 3 teaspoons of peanut butter to the mix. Frozen or fresh, grapes are a clean-foodies best friend. Snack happy with this colorful fruit, knowing that 1 1/2 cups are only 147 calories. I love a little crunch with my nut butters! Swap out the classic peanut butter for almond butter and you won’t be disappointed. 1 cup celery and 2 tbsp almond butter will add up to 206 calories depending on the brand. These Hemplete protein bars have quickly become my favorite on the market since they launched recently! With only 3g of sugar per bar, non-gmo and all the good ingredients, I’m totally hooked! Olives are a great snack! Add bell peppers to the mix and you’ve got yourself a low-calorie crunchy combination. What’s there not to love about the classic hummus and veggie combo? Pictured above is 10 baby carrots, 1/2 cup cucumber with 2 tbsp hummus. Whoever first decided that putting avocado on toast was a good idea, should be heavily rewarded. I love that you can get all the great taste of bread with Ezekiel toast, without all the added sugar or bleach. Top with a half an avocado and black pepper and you’ve got yourself a match made in heaven. This is definitely one of my favorite healthy snack ideas. Cottage cheese is a super easy snack to have by your side! I love to add Himalayan sea salt to my cottage cheese. Depending on the brand, 1/2 cup 4% cottage cheese should be around 160 calories. Also, this is a reminder that low-fat isn’t better and to go for the full-fat versions! Try this creative, healthy spin on pizza a try! Top a rice cake with 1/4 cup marinara sauce & 1 oz (2 tbsp) mozzarella cheese and heat in a pan or toaster oven. It takes a second to whip and your taste buds will thank you. Medium boiled eggs are one of my go-to healthy snack ideas! Get yourself this egg cooker from Amazon and your eggs will come out perfect and easy-to-peel every time. This combo pictured above includes 2 mediume boiled eggs and bell peppers. Combine 4oz smoked salmon and 1/2 cup cucumbers and you’ve got yourself a super-filling snack! Full macros for this snack are 12g fat, 1.9g carbs, 30g protein. Salty and delicious, olives are also a great grab-n-go snack. 9 green olive stuffed with red bell peppers are equal to 60 calories, 6g fat, 3g carbs, 0g protein. String cheese for the win! Two organic valley string cheeses are equal to 160 calories, 12g fat, 0g carbs, 14g protein. You can never go wrong with a handful nuts! Full of brain fuel, 1/4 cup or 30g walnuts is equal to 190 calories, 18g fat, 4g carbs 2g fiber, 4g protein. Diamonds are a girl’s best friend – more like almonds are a fit girl’s best friend! Almonds are one of the most nutrient-dense nuts – rich in vitamin E, magnesium, protein, fiber, copper, and selenium, as well as potassium, calcium, phosphorous & iron. 35 g almonds are equal to 210 calories, 16g fat, 9g carbs 4g fiber, 9g protein. Need more snack ideas? Check out these breakfast toast ideas for your morning snack!